Big Fat Piggy Bank: Don't Forget To Print! Quick reminder...I'm putting my coupons together for Walgreens and I wanted to remind you to print your $2/1 Excedrin coupons HERE before they are all gone! Buy 1 of the Menstrual Complete 20ct Gels, (on sale 2/$5 this week) pay $.50 & you get back a $2 RR for a $2 Money Maker, Yippee! You can see my full Walgreens Post HERE. I can't find this coupon. It must be gone already! 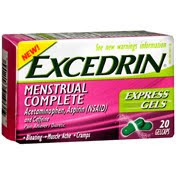 My walgreens does not have the excedrin on sale this week. Still a good deal though not as good as what everyone else is getting! Do you get the short ad in your area? My store didn't have any signs up for the Excedrin but I had them do a price check for me anyway and it rang up $2.50 and the RR came out with no problem. I WISH Wags had a price scanner! Hey, got free Q in the mail today! Woo Hoo! Still haven't gotten mine yet. Time to stock up!